The creamy textures work deep into the pores, leaving the skin looking purer, cleaner, brighter - without drying it out. 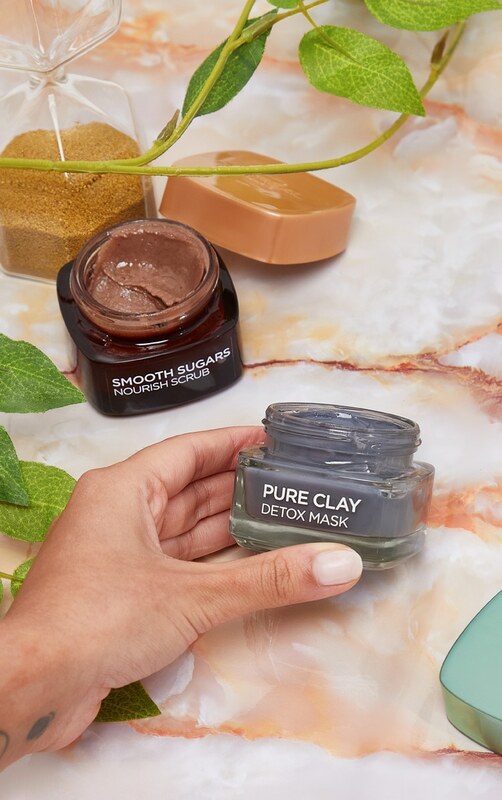 The kit includes 1 x 50ml pure Clay Detox face mask containing Charcoal to draw out impurities plus 1 x 50ml smooth Sugar Nourish Scrub containing Cocoa Butter to soften the skin and soothe dryness. 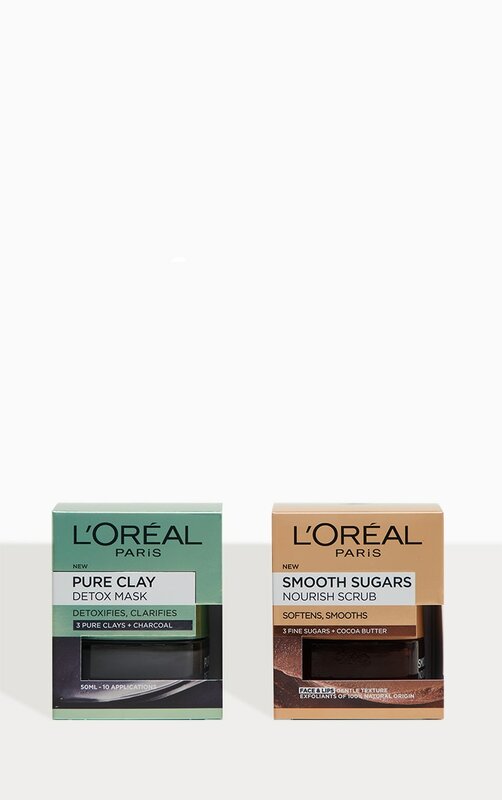 Step 1: Exfoliate with L'Oreal nourish Sugar Scrub, apply a small amount with dry fingers on clean, dry skin. Add warm water and gently massage over your face in circular motions avoiding eye area. Once sugars have melted, rinse with warm water. Step 2: Detox with L'Oreal pure Clay Charcoal Face Mask, apply a thin layer all over the face. Leave to dry for 5-10 minutes, then remove with a wet towel or warm water. Cocoa Sugar Scrub: Isopropyl Palmitate, Sucrose, C10-18 Triglycerides, Synthetic Wax, Glyceryl Stearate, Trihydroxystearin Glycine Soja Oil, Soybean Oil, PEG-7, Glyceryl Cocoate Perlite, Prunus Armeniaca Kernel Oil, Apricot Kernel Oil Cera Alba, Beeswax Rosmarinus Officinalis Extract, Rosemary Extract Theobroma Grandiflorum Seed Powder Saccharide Hydrolysate Glycerin Helianthus Annuus Seed Oil, Sunflower Seed Oil Silica Silylate Cocos Nucifera Oil, Coconut Oil Theobroma Cacao Seed Butter, Cocoa Seed Butter Caprylyl Glycol Tocopherol Pentaerythrityl Tetra-Di-T-Butyl Hydroxyhy drocinnamate Phenoxyethanol CI 77491, CI 77492, CI 77499, Iron Oxides Caramel Linalool Coumarin Limonene Parfum, Fragrance. 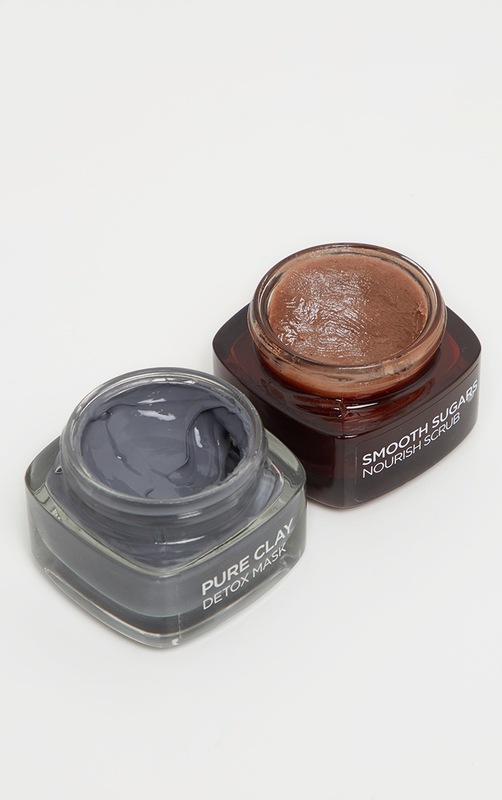 Detox Clay Mask: Aqua/Water, Kaolin, Montmorillonite, Lecithin, Polysorbate 20, Butylene Glycol, Propylene Glycol, Oryza Sativa Starch/Rice Starch, CI 77499/Iron Oxides, Moroccan Lava Clay, Charcoal Powder, Caprylyl Glycol, Citric Acid, Xanthan Gum, Polyglycerin-10, Polyglyceryl-10 Myristate, Polyglyceryl-10 Stearate, Sodium Dehydroacetate, Phenoxyethanol, Linalool, Limonene, Parfum/Fragrance.